The Senior Girls soccer team was off to represent the College at a state level this Monday, starting the day of with a 5am departure from the college. After a sleepy bus trip down to Melbourne, the girls arrived at the Darebin International Sports Centre. The first game kicked off and it was clear the WSSC girls were in it to win it, a 2-0 win helped settle a few nerves and you could feel the excitement building. A strong defence line made up of Courtney Hayward, Mykelti Kotzur and Maddie McFarland ensured a clean sheet. In the second game, the girls conceded early, however this evoked a brilliant response and they found the back of the net 5 times over the two 15 minute halves. Joey Cartwright, Jovana Bukvic and Annie Rowney were a formidable trio in the midfield and Zoe Chapman proved her worth up front. These girls were well supported with Emily McNicol, Jade Regan and Phoebe Moore running all day up and down the wings. Following this, the girls had their toughest opponent yet, the winner of this game would play it out to be crowned the number one senior girls team in the state. Following some spectacular saves on the unforgiving synthetic pitch, they lost their star goalkeeper, Amber Press. Tasmin Fischer and Maddy Tomkins both stepped up to the goal line and both made some great saves. Mathilde Bourel was absolutely fantastique, with the French recruit displaying her fancy footwork and speed. Goal for goal kept things pretty tight in this game, however a goal from Teagan Carmosin kept them within reach, Joey Cartwright sealed the deal in the dying minutes of the game. A 3-3 draw and an impressive goal difference put them through to the final. The Grand Final game was between Wodonga Senior Secondary College and Ballarat High School. 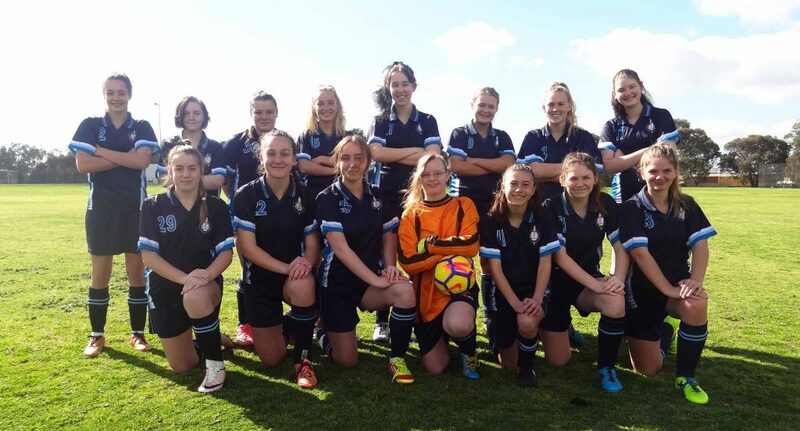 Every single player on the pitch gave it their all and Wodonga Senior certainly looked to be in it with a strong chance. The girls came off at half time with the score locked on one goal each way. A lucky goal came through for Ballarat in the second half and unfortunately there was simply not enough time to get it back. The girls walked away from the day with their heads held high, and so they should have, our Senior Girls Soccer Team received state tile of State Runners Up. Wow, what an achievement! Throughout the various levels, the girls have shown a great level of sportsmanship and positivity as a team and should be so proud. Well done girls. A big thank you to Faith Ezou and Elijah Shuker who were the linesmen for the day, Mitchell Eyers, the always calm assistant coach, and Di Larkin, a true all rounder- team manager, photographer, defensive coach and bus driver.